We the People White House petition calls for creation of a real Death Star. 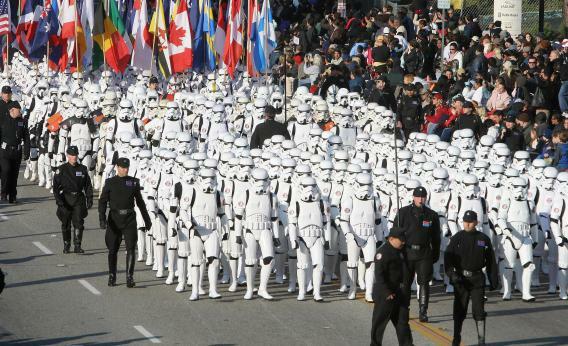 Star Wars fans dressed as stormtroopers march in the Rose Parade in 2007. They would probably support the Death Star petition. The Internet’s citizens want a real-life Death Star, and they want the White House to make it happen. With current unemployment rates hovering around 7.7 percent, it’s not the most harebrained idea I’ve heard, and the Internet seems to agree. Created by the Obama administration, “We the People” is supposed to be a space for American citizens to “take action on a range of important issues facing our country” by petitioning the government. If a petition reaches 25,000 signatures in 30 days, the site promises it will receive an “official response” after review by White House staff and policymakers. On Dec. 9, an appeal to sign the petition appeared on 4chan, the infamous (and usually NSFW) message board and digital prankster playground. The next day, it made the leap to reddit’s influential front page. From there, it was picked up by press and embraced by Twitter. According to social news analytics site Topsy, more than 6,000 individual people have tweeted “death star” and “white house,” with 1,600 mentioning “death star petition” in the last week. As of Wednesday afternoon, the petition has collected more than 20,000 signatures. It needs about 4,300 more by Dec. 14. We the People has seen a lot of action recently: Last month, disgruntled voters from every state started petitions to secede from the union, and 11 states hit the 25,000 threshold. The White House has yet to respond officially. As for the Death Star petition, maybe something will come of it. After all, the U.S. military is already seriously investigating interstellar travel. Our future space explorers will need protection out there.